Van Gaal says Inter play to win and Bayern play "beautiful football and win"
Mourinho will decide his future in the next "four or five days"
(CNN) -- UEFA president Michel Platini says he is disappointed that the buildup to Saturday's Champions League final between Inter Milan and Bayern Munich has been dominated by the coaches, and not the players. The showdown in Real Madrid's Santiago Bernabeu stadium has been widely billed as a battle between Inter Milan manager Jose Mourinho and Bayern boss Louis Van Gaal. The fact that Mourinho worked under Van Gaal at Barcelona has added intrigue to a match featuring two teams who won the league and cup double in their domestic leagues. Both managers have made bold statements in the run-up to the match, with the Portuguese Mourinho describing the contest as bigger than the World Cup final, while Dutchman Van Gaal claimed that Bayern play more "beautiful football" than Inter. Can Mourinho beat Van Gaal to become king of Europe? 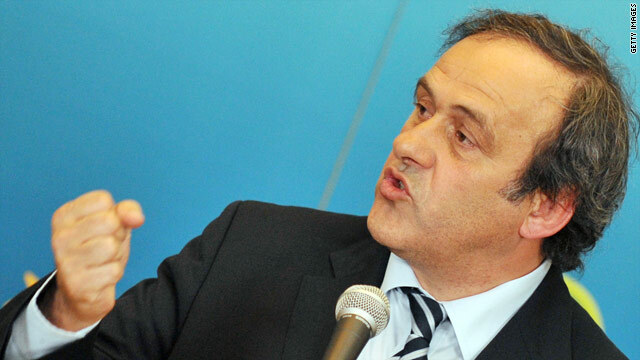 Platini, who said the final was "too unpredictable" to call, lamented the focus on the managers but suggested it may be a deliberate ploy to take the pressure off their players. "It's not good because the football belongs to the players, not to the coach, for me," he said in an exclusive interview with CNN. "But they are two big personalities; they've had some problems in their countries at the beginning. They won both the league and the cup, and now they come to the final and perhaps it's a philosophy to protect the players being in front of everybody, it's a tactic." Mourinho and Van Gaal are vying to become only the third manager after Ottmar Hitzfeld and Ernst Happel to win the Champions League with two different clubs. Mourinho won the European title with Porto in 2004 while Van Gaal triumphed with Ajax in 1995. "Tomorrow myself or Louis van Gaal will for sure become the third man in that group," said Mourinho. "Hopefully, and I speak for myself and also for Louis because I saw him today and he seems to be in very good shape, if we continue in our jobs the one who doesn't do it tomorrow (Saturday) will do it in the future. "I feel we will both join that group, one tomorrow and one later." Mourinho, 47, worked as an assistant to Van Gaal for three years when the Dutchman was in charge of Barcelona. "I think I educated Jose a little but he trains to win, I train to play beautiful football and win," said the 58-year-old Van Gaal. "My way is more difficult. "I think Mourinho is more defensive tactically but he has good players who can decide the outcome of a match. "I think Inter Milan are a very difficult opponent and I think their matches against Chelsea and Barcelona have proved that." Both teams will be missing key players through suspension, with Bayern lining up without French winger Franck Ribery and Inter lacking Brazilian midfielder Thiago Motta. But in keeping with the build-up to the match, Mourinho spent very little of his press conference on Friday talking about his team, and far more time fending off questions about his own future. Reports have linked the Portuguese with a move to Spain's nine-time European Cup winners Real Madrid next season.Mourinho said he was fully focused on the final and that "none of us can think about anything else. "After four or five days I'll decide, but when the game ends tomorrow I won't be able to say. When I won with Porto I knew before that I would leave for Chelsea, but right now I can't say," he added.